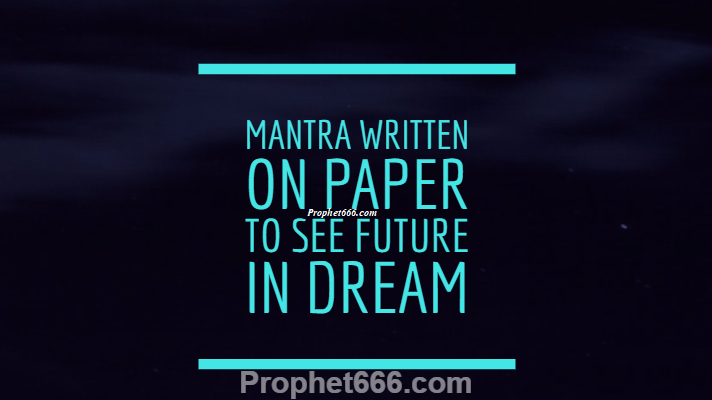 This Mantra to see the future in dreams that has been described in this post is different from most other Mantras of this kind because this Mantra has to be written on a piece of paper and kept under the pillow at night for dreaming about the events that are going to happen in the future. The procedure of using this Mantra for getting Precognitive Dreams has been described below. 1] The practitioner has to chant the Mantra given below for 1 Mala or 108 Mantra Chants on either a Tuesday or Sunday in order to be able to use it for seeing the future in dreams. Any counting rosary, like a Rudraksha Japa Mala can be used for this purpose. The word – Amukasya - अमुकस्य in the Mantra should be replaced with the name of the practitioner. Only the Hindi / Devanagari version of the Mantra should be written on the piece of paper, which has to be kept under the pillow. 3] Then, the Mantra has to be written on a piece of white paper using this past. Any small pointed wooden or metal stick can be used as the pen. 4] Then, this Mantra written piece of paper should be nicely folded and kept under the pillow, while going to sleep at night. This is said to enable the practitioner to see all the happenings that are going to occur in the future in dreams. If the practitioner does not get success in this “dreaming about the future Mantra Prayog” then, he should chant the Mantra for 1 Mala for 3 days continuously. This procedure should also be started on either a Tuesday or a Sunday. If any of our readers attempts this Mantra Experiment and gets to visualize future events in precognitive dreams, then they should share their experiences for the benefit of everyone. Hello Neelji, these dreams could be indicating bad/sad events too? Neel ji, second point is slightly confusing. The ink specified is black or blue, but none of the paste if prepared with, would make the paste turn to black or blue. The first 2 items have to be taken in equal quantity and a few drops of ordinary blue/black ink added to make the paste.